The so-called ‘crises of capitalism’ has neither reversed nor prevented the emergence of an international class of billionaires who acquire, merge and invest in each other’s activities. The growth of wealth has been accompanied by the pillage of accumulated profits from productive sectors which are stored as wealth not investment capital. 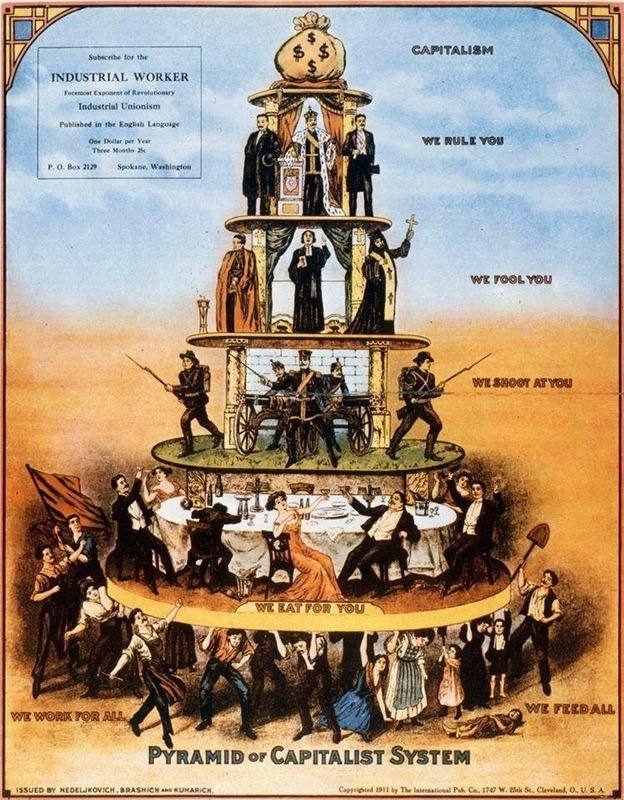 The original source of private wealth is the exploitation of labor by capital,of which a small percentage of the profits are reinvested in expanding production in the ‘home market’ or overseas. The bulk of the profits are transferred into financial networks which in turn illicitly channel the funds into overseas accounts. The entire process of de-capitalizing the economy is underwritten in the US by the financial elite’s controls over the executive branch of government, especially the ‘regulatory’and enforcement agencies -Security Exchange Commission, the Treasury and Justice Departments. Financial institutions facilitate the inflow of trillions of dollars from the kleptocrats in the developing countries as well as the outflow of trillions of dollars by multi-nationals to off-shore tax havens. In both instances the banks are key instruments in the process of dis-accumulation of capital by dispossessing nations and treasuries of revenues and productive investments. Despite wide variations in the class structure between ‘developing’ neo-colonial and developed imperial states, the top 1% across national boundaries has forged economic, personal, educational, and social ties. They attend the same elite schools, own multiple private residences in similar high end neighborhoods, and share private bankers, money launderers and financial advisors. Each elite group has their own national police and military security systems, as well as political influentials who also co-operate and collaborate to ensure impunity and to defend the illegal financial flows for a cut of the wealth…. The investigatory authorities of each developed country tend to specialize in prosecuting rival financial institutions and banks, occasionally levying fines – never imprisonment – for the most egregious swindles that threatens the ‘confidence’ of the defrauded investors. Mexico’s ruling elite organizes massive illicit financial flows, mostly laundered by US banks, ranging from $91 billion in 2007 to $68.5 billion in 2010. The massive increase in illicit financial flows is greatly facilitated by the de-regulation of the economy resulting from the North American Free Trade Agreement (NAFTA). Contrary to most leftist critics the main beneficiaries of NAFTA are not Canadian mine owners or US agro-business or auto manufacturers – it is the US and Canadian financial and real estate money launderers. From 1960 to 2010 the Brazilian 1% pillaged over $400 billion dollars. These illicit financial flows are laundered in New York, Miami, London, Switzerland and Montevideo. In recent years the rate of pillage has accelerate: between 2000 -2012 illicit financial flows averaged $14.7 billion a year. And under the self-styled ‘Worker’s Party” (PT) regime of Lula DaSilva and Dilma Rousseff, $33.7 billion in illicit outflows were laundered annually – 1.5% of the GDP. Much of the pillage is carried out by private and public “entrepreneurs” in the so-called “dynamic” economic sectors of agro-minerals, energy and manufacturing via ‘trade mispricing’, import overpricing and export underpricing invoices. India’s capitalists- as kleptocrats – have long played a major role in de-capitalizing the economy. According to the Financial Times (11/24/14, p3) the Indian elite’s illicit financial flows totaled $343 billion dollars from 2002 to 2011. The Indian Finance Ministry immediately threw up a smoke screen on behalf of the 1%, claiming the Indian elite had only $1.46 billion in Swiss accounts. Most of India’s wealthy have taken up with holing their illicit wealth to Dubai, Singapore, the Cayman and Virgin Islands as well as London. The illicit financial flows surpass the capital invested in productive activity. The process of dis-accumulation of capital through relocation is channeled to overseas shell corporations and private bank accounts and beyond into financial holdings and real estate. The accumulation of private wealth exceeds the sums invested in productive activity generating investments and wages. Massive perpetual tax evasion means higher regressive taxes on consumers (VAT) and wage and salaried workers, reductions in social services, and austerity budgets targeting food, family and fuel subsidies. The past thirty years of deregulated capitalism and financial liberalization, is a product of the financial takeover of state regulatory agencies. The signing of free trade agreements has provided the framework for large scale long-term illicit financial flows. The growth and ascendancy of financial elites which pillage public treasuries, resources and productive activity, is the result of an eminently political process. The origins of de-regulation, free trade and the promotion of illicit flows are all made possible by state authorities. First and foremost, finance capital conquered state power – with the cooperation of “productive capital”. The peaceful transition reflected the interlocking directorates between banks and industry, aided and abetted by public officials rotating between government and investment houses. The entire African continent was pillaged by billionaire rulers, many former nationalist politicians (South Africa), ex-guerilla and ‘liberation leaders’ (Angola, Mozambique, Guinea Bissau), in collaboration with US, EU, Chinese, Russian and Israeli oligarchs. Trillions of dollars were laundered by bankers in London, New York, Zurich, Tel Aviv and Paris. Growth of the commodity sector bolstered Africa’s decade long expanding GDP – and the mega-outflows of illicit earnings. World-wide, billionaires multiplied profits ‘received’, but wages, salaries, pensions and health coverage declined! Swindles multiplied as outflows accelerated in both directions. The higher the growth in China, India, Indonesia and South Korea the bigger and more pervasive the corruption and outflows of wealth-led by “Communist” neo-liberals in China, Indian “free marketers” and Russian “economic reformers”. Factories still produce, agro-business still exports, the paper value of high tech companies has risen into the high billions, but the ruling 1% of the system stands or falls with the illicit financial flows drawn from the pillage of treasuries. To replenish pillaged treasuries, regimes insist on perpetual ‘austerity’ for the 90%: greater pillage for the 1%, less public revenues for health care which results in more epidemics. Less funds for pensions means later retirement — work till you die.